The outer insulation jacket which provide the cable protection against heat, cold, solvents, sparks, oil, tar and ozone. In welding, one of the more important accessories for an arc welder tool is the cable that connects the arc welder head to the power source. The cable has to be capable of carrying a high load of currents, as well as being able to resist a wide range of abuse from the harsh conditions of the welding environment. Welding cable is typically insulated with PVC (Polyvinyl Chloride), Neoprene, or EPDM (Ethylene Propylene Diene Monomer), all of which are durable elastomers with highly resistive properties that can protect the cable from extreme conditions. Neoprene and EPDM are synthetic elastomers which are resistant to abrasion, heat, cold, solvents, sparks, oil, tar and ozone. PVC is another elastomer insulator for welding cable which has similarly satisfactory resistance to mechanical and chemical exposure. EPDM elastomer is the most common synthetic rubber insulating jacket for welding cable. 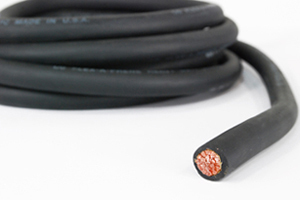 EPDM welding cable exhibits a strong resistance to harsh weather, abrasion, moisture and water. However, it gives only a satisfactory level of resistance to chemicals, oils, gasoline, kerosene, and acidic solvents. Neoprene welding cable maintains a higher level of elasticity over a similar temperature range compared to EPDM. It is also resistant to degradation from sun, ozone and weather. Neoprene performs better than EPDM when in contacts with various chemicals, grease and oil. EPDM and Neoprene welding cables are comparable in term of cost, exhibit a similar durable ruggedness, and are highly resistant to abrasion. Both are resistant to damage from ozone and are able to remain flexible over a wide range of temperatures. EPDM and Neoprene are not very resistant to gas and petroleum based liquid. PVC is relatively low in cost and is manufactured with several different classifications. Standard PVC has good resistance against abrasion and chemical contacts. Standard PVC also has high resistance to cuts and tears. Semi-rigid PVC is tougher and has greater resistance to abrasion, but it is less flexible. Cables insulated with irradiated PVC are cross linked by means of irradiation. Irradiated PVC has good abrasion and chemical resistance. Flex-A-Prene is a brand label which is an EPDM jacketed cable. 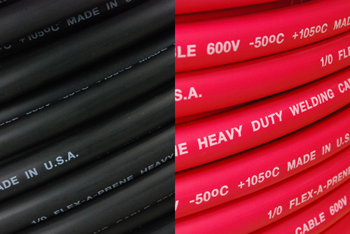 Welding cables come in variety of colors, including, black, red, orange, yellow, blue or green. Welding cables can also come with brighter fluorescent jacket but it is very uncommon.TEMCo currently provide two of the more popular color for welding cables, red and black.